This one’s for you, Putkunz. So wood moves in mysterious ways right? Well the 77 degree trestle table top decided to go just as the humidity dropped in our workshop to about 32% last Thursday. And that is pretty low. Still, that’s what happens here when you get that southerly blowing straight off the south pole, and believe me, that is one dry wind. So there’s a hand-powered conclusion to a hand-powered start for this table; the tally so far includes all four handplanes in the image above, the marking knife, the four Japanese chisels, the router plane, the western tenon saw, and the Japanese ryoba saw. Altogether a great project for hand/eye practice, and I really don’t think any electrically powered friends would have done this job any quicker…. The pile of shavings behind the top represents the degree of wood that had to be taken off to take that top back to level and it is with great pleasure that we found the time to run these 10 pounds (5 KG for you metric types) of ductile iron back and forth until this job was done. Now, I could have thrown this top on the ute, driven over to Charlie Sandford’s heaven for industrial machinery and paid a hundred bucks an hour to grind this thing flat under ever increasingly fine abrasive sheets. But why would I? I’ll save that for the home grown Eucalypts. Now they really are beyond the power of my hand plane. 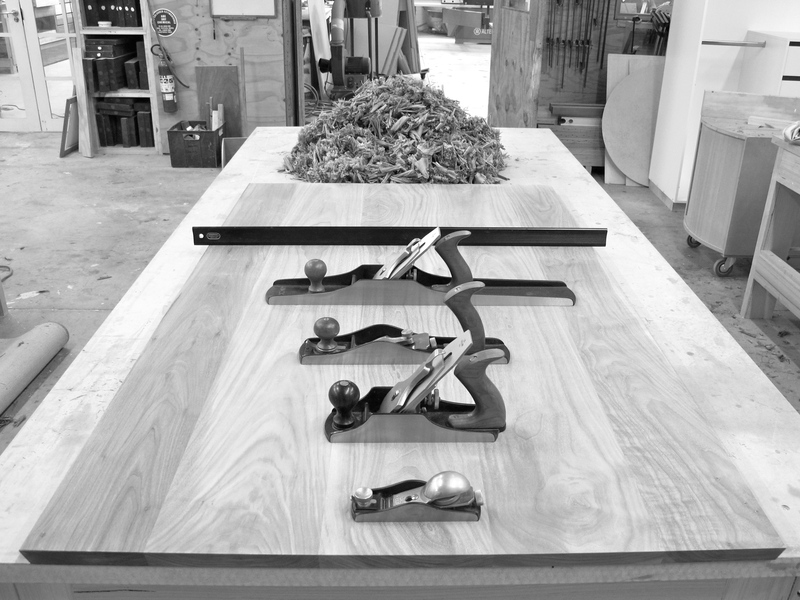 This entry was posted in Handtools, Tables. Bookmark the permalink. 3 Responses to This one’s for you, Putkunz. Well it looks so beautiful – why can’t I have one? Hey, no worries, I’ll just drop one in the post… Actually it’s a knock down table so it’ll pack down quite small. Well a colour photo showing the wood would be great – before I put in a definite order for my flat pack!